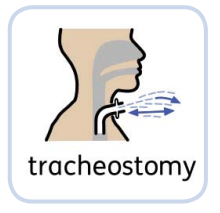 This resource, designed by a speech and language therapist, can be given to families as an information leaflet or to use in preparatory discussions with a child who is due to have a tracheostomy. Accompanying flashcards/symbols can be used to support the child’s understanding throughout the procedure to prepare them for what is going to happen next. The child can also use the flashcards to support their expressive communication after undergoing a tracheostomy, when speaking may be difficult or impossible for them. This resource was developed in association with Liz Clements,Speech and Language Therapist, Community Children’s Health Partnership, North Bristol NHS Trust.